This is the third in a series of case-study podcast interviews with successful Blog Mastermind students, where we look at what they do right in order to achieve above-average results. First it was Mitch, who’s blog exploded in popularity ramping his traffic quickly beyond 5,000 daily visitors. Leigh’s interview was extremely popular as she explained how she went from making $20 to $4,500 a month with her online business. Today I interview Leslie, who made almost $32,000 in 2008 working part-time online (he’s a full-time teacher, and we all know how hard teachers have to work! ), and has an interesting story to tell because of the unique way he makes money. Leslie’s market is freebie offers and rather than explain how it works here, you should listen to the podcast. It’s interesting that you can actually make money by offering freebie giveaways that other companies provide, and that’s how Leslie makes the majority of his online income. Leslie has taken his expertise and transformed into a thriving blog called The Freebie Guy. His next step is to launch a membership site and in preparation for this, he just released a new free report called – The Freebie Report – which teaches how Leslie does what he does with freebie offers. Leslie is not only a Blog Mastermind student, but he’s taking part in every single coaching program I have on the market as I type this. What I love about this is every week I see more evidence of how much effort Leslie is putting into his business and how much output he creates every day, DESPITE having to work a full-time job. Leslie is proof that, with discipline and enthusiasm, you can juggle your salary job as you need it to pay the bills, while you build up your online income. I expect in Leslie’s case that sometime this year (2009) he may say good bye to his job as his online income grows. Can You Work Part Time Build Your Online Business? What an amazing podcast.Thanks Yaro for choosing such gems for your interviews.We are all benefited and encouraged by such success stories.Congrats Leslie……….You are really great and have made your mentor Yaro proud. Hope your dream of quitting your day job comes true in 2009. Just goes to show how thinking differently can really make all the difference in online success. Great lesson in that there are always unique ways to market yourself online no matter how “saturated” we may think it already is. Yes exactly my feelings.All we have to do is think innovative ideas. And there are lots of them waiting to be discovered. Great to hear so many success stories coming from your blog mastermind program! Great interview Yaro. I think I had the same epiphany as you during this, that you can make money online with FREE products…never occurred to me. It’s great to see online marketers and bloggers exploring many different business models by which to make a living. I have to say, I really like your interviews. You do a good job getting the right people, asking the right questions, and nailing the distinctions down. Just wanted to congratulate you on the +58 places your site has climbed on the Winning The Web, Internet Marketing Top Blogs! Hi Yaro and all folks ! Very interesting and simple strategy explained here, which does make me very happy. I have not been blogging very long, but it’s good to know that my decision to give info and products away is fully endorsed by the best guys on the Internet. Don’t you love it when a plan comes together ! Yaro, you continue to impress me on how powerful a soft-sell really is over the long run. These are fantastic case studies and marketing materials to help elevate your authority online. Keep-up the great work! 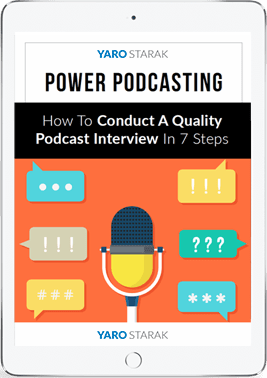 You could not have choose a more focuses and determined person to feature in your podcast. Leslie, is one of the most driven and creative people I have meet online. From day one he was thinking out side of the box when it came to freebie trading. I feel fortunate to call him my personal friend. Like Leslie, I have had success with freebie, its a process that works. That’s a very inspiring interview. It’s great to listen to people’s success stories and be inspired to get similar result. Nice work, Yaro and Leslie! Wish you all wonderful 2009. WoW, Creative Ideas still are the solution to the economic problems, if each of us pauses for an hour to observe the needs of the people around us, we will fond many extraordinary Ideas that will absolutely sell. Wow, great listening! I love when bloggers allow me to listen to podcasts while I’m travelling. I will eventually buy this course, but I am waiting to see if your will come out with an updated version for the new year. Hi Guys, Glad you like the interview. It was definitely fun to do with Yaro. It has been a great year (especially for my first serious year and only doing it part time). One thing that I learned is that if you follow success, you will be successful. Freebie trading has been fun, I’ve made money and really enjoyed meeting great people. However, I MUST emphasize how greatful I am to Blog Mastermind, because I would NOT have been able to take it to the level I’m at now without it. Great interview! Never say never even during tough economic times. Freebie giveaways are always a great way to “lure” prospects to your main opportunity. Earn their trust then they will buy from you. Really enjoyed Leslie’s story. It’s inspirational to a newbie like me! I look forward to reading more of your posts and learning from those who are more experienced. Great !! Your Articles Inspires us a lot and gives us the strength that we also can Thx!! Man! I got to tell you Yaro, you frustrate the heck out of me! I just spent three blissful weeks with three beautiful children and the most wonderful woman on the planet, and along the way, I came across your blog. Sleeping in, unrushed time with the kids, enjoying my lady’s company, the freedom to dream (with great fodder coming as a result of my exposure to your site)… it was simply wonderful. Of course, that all came to an abrupt halt yesterday, like a balloon being burst, with the return to the dreaded ‘day job’. This morning, as I listen to your pod cast with ‘Leslie’, I am both inspired and frustrated… Inspired because I am reminded of the potential for my future (if ANYone else can do it, so can I), and frustrated because I can’t wait to sink my teeth into this industry and get started on the path back to those blissful days where my time is my own, allowing me the freedom to live each day on my terms. Hey Russ, the best thing I can tell you is JUST DO IT. You aren’t risking much by doing it. You can start with your online business part time. That’s exactly what I do because I have a full time job. Like I’ve heard many times before, if you continue doing the same thing, you WILL get the same results. If you want to be an online success, the first step is to change what you are doing right now. If you are waiting for the perfect time, it won’t come. Your situation doesn’t have to be perfect, you just need to get started! That’s the philosophy I’m trying to live by. Thank U, Yaro!! Your articles inspires me to do this like your’s succes. Such creativity must be applauded. I admire your “out of the box” perspectives. Hi Yaro, somewhat off topic but I was wondering what software you use to record your interviews… they are incredibly clear… what’s your secret? http://Buzvia.com – Where’s Your Traffic Going? This is an excellent example of innovation online. 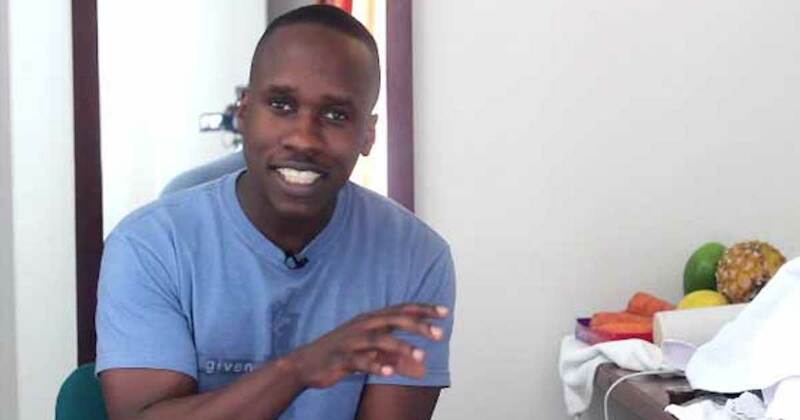 Yaro, I hope that you will continue to bring us interviews of successful online entrepreneurs (and I know you will)! Thanks everyone for the great replies (sorry for the frustration Russ!) and thanks to Leslie for agreeing to do the call with me. Mate, trust me… the frustration is of a good and positive type! Contrast is so important in life, like the gaps between the notes being the real music. Thanks again for your presence on the web. Although I am very green when it comes to blogging, it is great to have my personal methodology and approach affirmed by your own consistent efforts. All of a sudden, the ‘Net’ has become a cooperation and not a competition. That is awesome! Great job to Leslie and great job to you for teaching him the ropes in a way that will make him a success online! It is inspiring for fellow Blog Mastermind students to see the success of Leslie. Great job and keep up the good work Leslie! That proves it that you are a genius at online marketing. I might have to start up a second part-time job of blogging. The extra money would be nice, if not only for the sake of paying for my gasoline for my car. This is a very interesting interview and I’ve learned a lot. I will try to see with Leslie how what he does differs from the beauty samples I’m promoting on our site. We’ve seen an increase in affiliate income from free products on the site and we’ve even created a permanent page for them on our site (http://www.mybeautymatch.com/free-beauty-samples-page/) , but it’s nothing close to the income Leslie is pulling. Since we want to break the current site and create a new site focus on nutrition some of the products Leslie is offering as part of his free offers (like free kitchen appliances) could really fit our market and help boost affiliate income for 2009. This is a whole new arena, but it obviously works well if Leslie has been able to make a “low end corporate salary” doing this only a few hours per day. This is surely a branch most of us bloggers should really take a look at. It definitely can help for your niche Gisele. That’s what I like about freebies. The example you used is perfect. Instead of trying to sell kitchen supplies to your users, you can show them how to earn it for free, while getting an income for yourself. It works out pretty well. I want to thank Yaro and Leslie for a great interview . I did a few freebie trades and then sort of moved on to other stuff. I love Leslie’s philosophy and positive energy and will be looking to complete some offers for him this week and also creating part time income from Freebie Trading ! !I also want to combine this with some other business models . This is an inspirational interview. It proves that to think different is not failure and it may lead to great success. Every marketer should be in constant search of the unique and uncommon ways for selling and promoting his products and services. There is no place to stop on the achieved. I read your blog profits blueprints. It was an very useful e-book. You have mentioned about pillar article and its importance. Yes you are right. I have a photoshop tutorial blog and made one tutorial that attracted many and increased my traffic. Guess what? More clicks on my adsense ads. I left hope hope on blogging few months ago. After reading your e-book I came back to blogging with new energy and trying to improvise it with your fine suggestions mentioned in the e-book. Thank you very much for supplying that e-book for free and it is helping many amateur bloggers like me. I’ll will wait for another interview Yaro, I think your interview always inspire many bloggers..Thanks alot.. Thanks Yaro and Leslie too! This was a very interesting podcast and although it isn’t the field in which I’m interested, (those nasty pop-up offers aren’t any fun) it is worth looking into and a worthy compliment to your podcast series. Thanks much, Yaro, for this interview. Wonderful ideas and amazing creativity. business world, possibilities are truly limitless! I cannot tell you how much i enjoy freebie trading. Leslie, “The Freebie Guy” is the greatest. His site Calistyle101 is wonderful. He has tutorials that guide you step by step through the freebie trading forum. What I love the best about Calistyle101 is that Leslie or Chris, his partner include themselves in the shout box and interact with forum members. Have a question? Just ask, and you will get more answes to your one question then you ever expected. Everyone jumps in to help you succeed. Leslie, we love you and Chris for taking the time and patience to help us through to make money. Keep up the good work guys! Wow…it’s very-very great information Yaro…thank you very much for you and your student Leslie who had talking about the right way to make money fast on the internet. Great article or better to say interview. It was very inspiring for me. Thank you Yaro and Leslie. Nice blog Yaro. Have a nice weekend! Wow This is a GREAT interview, thanks for sharing it with all of us! Leslie took freebie trading to a whole new level one that has not been seen in freebie trading before. Leslie has left the industry to pursue has passion to teach Biology, I’m sure he will do GREAT as like he did in Freebie Trading, he will be missed… Thanks! I always enjoy reading your posts. This is very inspiring to hear all the success stories. I am definitely joining your coaching program in the near future! Very nice interview. I am sure he has already quit teaching by now and is a full time blogger. Focusing on building authority sites. That’s Leslie made.